Bored with the classic Burt's Bees lip balm? Try this one.It's new, flavored like fruit spread and moisturizes like no other balm. For something that's $3, this is a total gem. Leave lips feeling renewed, moisturized and healthy with this 100% natural lip balm. Superfruit, açaí berry, provides free radical fighting antioxidants and vitamins A, C, D and E, as well as healthy Omega oils, giving your lips a rejuvenating experience with a rich, sweet flavor. We call that one super balm! The balm has the classic Burt's Bees packaging and has a beautiful fruity smell. The cap is purple n cute which I am assuming is because Acai Berries are purple in color :) It's white in the tube, goes on transparent and leaves no film on the lips.It does not have any tingle like the original Burt's Bees. It feels so light on the lips - almost close to nothing. It's going to be a super base for even the most drying lipsticks. I find Revlon Matte lipsticks to be really drying on my lips and this little baby made them go on so smoothly. What I like about this Balm? What I dislike about this balm? I'd have to re-apply this more often than other balms. That's probably because it's so yummy that I lick it off my lips. Hey, not the balm's fault! I love applying it in the night and waking up to pillow soft lips. Some may find the smell a bit too fruity for night use. I would definitely be buying this again for sure.In fact, I prefer this one over the original Burt's Bees Lip Balm. 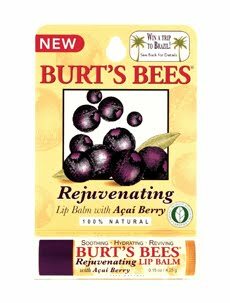 Have you tried Burt's Bees lip balm with Acai Berry? Do you love it?What are your favorite lip balms? hey is it new ??? i mean ur blog? Thanks Rashmi :) yes, its new and just started following your blog! I love this lip balm. Got it on Aarthi's recommendation and yeah I too kinda lick it. :P But I am surprised at the amount of product you get in this. hey d follow button is fine..
the best thing about it is that it's not making your lips look soak in wet. But it acts like a moisturizer by making it look fresh. @Gold Eye Serum - Totally agree with u!